Here’s some health advice for those of you who are starting to have a little trouble with your memory: try drinking an herbal tea made from sage. Sage is that popular herb that helps to make Thanksgiving dinner a delicious one. But the herb also has a long history of medicinal use as well. Our ancestors used sage as a compress. An herbal preparation made from the leaves was applied to sprains and injuries to help reduce swelling. Sage was also used to calm the nervous system. In one clinical trial, clary sage was used for aromatherapy in a midwife clinic. For this large trial, 8,058 mothers who were in labor were recruited. The women gave birth under different circumstances—spontaneous labor and birth, caesarean sections or induced labor. What the researchers found was that clary sage and chamomile were effective for easing pain. Clary sage also helped in lowering the anxiety and fear in the women during childbirth. Sage is a healing superstar, mostly because of its natural oils. 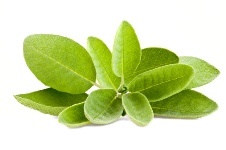 Sage oil contains tannins, flavonoids and camphor—all excellent for stimulating and boosting your brainpower. Researchers at the Brain, Performance and Nutrition Research Centre at Northumbria University in the U.K. tested the effects of sage extract on cognitive performance. For this study, 36 healthy adults were given either capsules containing sage essential oil or a placebo. They were then asked to do some tests such as completing computerized memory and attention exercises. The researchers found that the participants improved their scores on these tests; with the most improvement occurring one hour after taking the sage capsule. But there were even more benefits: sage essential oil also reduced the participants’ mental fatigue and increased alertness. How? Well, that’s because of terpenoids, which inhibit cholinesterase, a family of enzymes that trigger a reaction in the neurotransmitter acetylcholine. Acetylcholine boosts the performance of your memory, thoughts and judgment. If you have Alzheimer’s, you have less acetylcholine. Consequently, when cholinesterase is inhibited—which is what sage was found to do—you’ll end up with more acetylcholine and that’s a good thing. You can look for sage essential oil at your local health food store. Alternatively, you can try drinking a tea made from sage leaves. You can make this “brain tonic” yourself at home and drink it whenever you need it most. For some, clearing the cobwebs away first thing in the morning is important. For you, it might be that you need sage tea as a mid-afternoon pick-me-up when your blood sugar dips. If you’d rather drink sage tea in the evening, there are benefits for that, too: it can clear your thoughts and calm your nerves. All you need to do is boil some sage leaves, strain the liquid and then sip the tea. What a great (and inexpensive!) home remedy. Burns, E., et al., “The use of aromatherapy in intrapartum midwifery practice an observational study,” Complement Ther Nurs Midwifery February 2000; 6(1): 33–4. Kennedy, D.O., et al., “Monoterpenoid extract of sage (Salvia lavandulaefolia) with cholinesterase inhibiting properties improves cognitive performance and mood in healthy adults,” J Psychopharmacol. August 2011; 25(8): 1088–100.